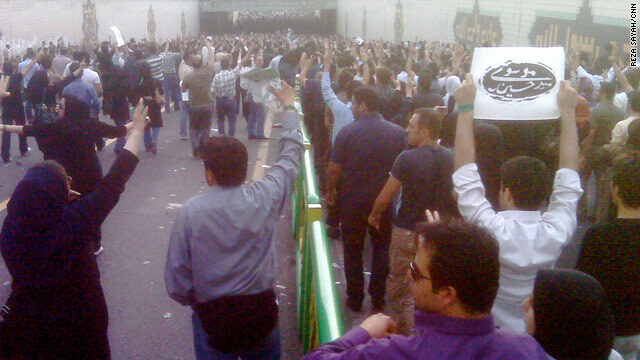 Protesters take to the streets of Tehran in June 2009. (CNN) -- Nima has felt the force of a club come crashing down on his body in three separate beatings by Islamic security forces over the past year. Azadeh repeatedly has tossed herself in the throes of mass protests through the streets of Tehran, engaging in the now well-known, cat-and-mouse game of people versus brute force. Ehsan and Kianoosh refused to keep silent, speaking out until the only choice left was to leave their country. "It was like losing a piece of my body," said Ehsan. As Iran marks its first anniversary of the June 12 presidential elections, the four -- who asked to be identified by aliases for fear of their safety -- will find themselves in a position distinctly different from where they were a year ago. While Azadeh and Nima planned to return to the streets as veteran protesters, Ehsan and Kianoosh will watch from afar. "There is fear," said Azadeh, a 30-year-old bank teller in Tehran. "I can't say I'm not scared, but you still have to go out -- because that's what the government wants, for you to be afraid and not continue. But we have to." The disputed presidential election sparked widespread outrage within the Islamic republic, thrusting the depths of Iranian society into the global spotlight and inciting violence that hadn't been seen decades. A diverse opposition movement -- headed by presidential reform candidates Mir Hossein Moussavi and Mehdi Karrubi -- grew into today's Green Movement, protesting for social justice, freedom and democracy in demonstrations throughout the country since the June polls. The two opposition leaders, both from the ranks of supporters of the late Ayatollah Ruhollah Khomeini, who led Iran's 1979 Iranian Revolution, accuse the current hardline regime of stealing the election and staging a brutal crackdown. "Before the elections, I think part of the society believed in the system," said Nima, a 30-year-old university researcher. "But after the elections, most people saw how brutal the system was with violence against its own people." Weeks ago, Moussavi and Karrubi called for demonstrations on June 12, asking opposition groups and reformist parties to apply for rally permits. But just 48 hours before the election anniversary, the pair called off plans for protests, citing reports that the Islamic government was once again preparing security against demonstrators and warning against gathering in the streets. "Hardliners and repressors are being organized to attack the defenseless and innocent people," Moussavi and Karrubi said Thursday. "We ask the people and the protesters to demand and follow up on their rightful demands and requests through less costly and more effective methods." Some, including Azadeh, said the opposition's cancellation wouldn't change their plans to protest, though others are focusing their attention and energy beyond the public protests. While the opposition movement initially had strong showings with seas of green banners, arm bands and signs coursing through Tehran and other cities, the protests have largely fizzled out in recent months. Perhaps the most evident sign of this was on February 11, when Iran's security forces clashed with demonstrators -- coming through on a promise to crack down on protesters on the 31st anniversary of the Islamic Revolution and the fall of the Shah. Few demonstrations have been organized since then, leaving observers to wonder what's happened to the opposition and the protesters. The fruits of the opposition's labor, however, are still fresh to many. "Their struggle wasn't in vain, there was an outcome," said Kianoosh, a 30-year-old blogger who fled Iran after plainclothes security personnel arrived at his home looking for him. He hid in a friend's basement for the next 27 days, before paying someone $500 to help him flee the country. "The important thing was to get rid of that fear," he added. "When that taboo was broken, that fear disappeared. People are no longer afraid of the regime." Some within the movement say it's still growing, though its future is uncertain. "In the beginning, the movement was like a child. As it's growing, it is taking a different shape," said Azadeh. "It doesn't need violence to continue." Ehsan, a 31-year-old engineer and poet, fled Iran after repeated questioning by authorities, accusing him of composing "un-Islamic" and "anti-government" poems. He said that over the past year, the people of Iran have an "increased awareness" about their world since the elections. Indeed, the protesters are no stranger to the violence that became virtually inevitable after the election. Ahmadinejad's administration, under the watch of Supreme Leader Ayatollah Ali Khamenei, has vowed to respond with force against any protests. Thousands were arrested during last summer's demonstrations -- including former lawmakers, political activists, local and international journalists, filmmakers and foreign nationals -- and hundreds were accused of engaging in a "soft revolution" and tried in court. At least 11 protesters have been sentenced to death after the election, and a few have already been executed. Nima blames the government's emphasis on security for the opposition shifting out of the public eye. "The biggest reason is the violence by the government," he said. "The violence didn't allow people to protest." "It could also be that some people don't want to get themselves in trouble for no reason," Nima continued. "I see this lull as kind of a breather with people waiting for the right time to come out the again." The lull has left Iranian experts at odds over whether the opposition movement has lost steam against the oppressive regime, or is simply broadening its ranks and reach in a methodical fashion. "The opposition can't expect reform in the current structure. The system has to be completely changed," said Ali Alfoneh, a resident fellow at the Washington-based American Enterprise Institute who has researched the relationship between Iranian civilians and the Revolutionary Guard. Alfoneh noted that an increasing part of the government's strength is its well-organized security forces -- posing brute strength to counter the protesters -- that answer straight to Iran's current supreme leader, Ayatollah Ali Khamenei. Iran's Revolutionary Guard Corps (IRGC) was established after the Islamic Revolution to defend the regime against all threats, "but has since expanded far beyond its original mandate," according to the Council on Foreign Relations, a U.S. foreign policy research center. "Today the guard has evolved into a socio-military-political-economic force with influence reaching deep into Iran's power structure," the CFR says, noting that several current and former IRGC members have been appointed to positions as ambassadors, mayors, undersecretaries, provincial governors and cabinet ministers. During the demonstrations that followed the election, the IRGC's paramilitary volunteer force -- the Basij -- was seen chasing protesters on motorcycles and attacking them. Amateur videos showed members of the Basij, wearing plain shirts and pants and wielding clubs and hoses, dispersing protesters and beating a handful of Iranians at a time. The Islamic regime has also been successful in hurting the opposition's rank-and-file -- not by arresting its leaders, but by nabbing mid-level managers, political party activists, those who manage communications between the leaders and members of the movement. "It's made it impossible for the Green Movement to mobilize," Alfoneh said. Others keeping an ear to the movement aren't so easily convinced. What's more interesting than the opposition not demonstrating lately, they say, is the fact that the government has scaled-down its own trademark state-sanctioned rallies. Consider this past week when Iran would have celebrated Khomeini's life by commemorating his June 3, 1989, death. Though state-run media promised "millions" of followers to turn up for an event around the shrine where Khomeini is laid to rest, video and independent media put the crowd in the thousands. And the three-days of annual mourning ceremonies for the Islamic icon was reduced to a single day of government observance. Another example is the May 31 Israeli raid on a Gaza-bound flotilla, in which commandos intercepted the convoy at seas and stormed the largest vessel, killing nine people aboard. The ships were carrying humanitarian aid to Gaza, the Palestinian territory that has been blockaded by Israel since its takeover by the Islamic movement Hamas in 2007, and the deadly raid sparked international condemnation. Such an incident would have typically prompted the Iranian government to encourage its people to protest in favor of Palestinians. But that didn't happen this time, noted Mehdi Khalaji, a senior fellow at The Washington Institute for Near East Policy. They "did not encourage people to come to streets for demonstrations, obviously, because they cannot control people easily any more," Khalaji said. Khalaji indicated that the opposition movement is seeking to expand and strengthen by looking beyond Tehran and speaking with different ethnic and religious groups and organizations involving women, human rights and labor unions, in order "to form a bigger social power." "The Green Movement is mostly trying to inform people about their rights and raise their awareness," said Ehsan. Moussavi and Karrubi are looking to decentralize their role and put leaders in the ranks, Khalaji said. The movement is also moving away with its old strategy of mobilizing on national and religious holidays, when the government expects demonstrations and beefs up forces accordingly. "We're dealing with a very difficult society and a very difficult government. We can't expect them to take to the streets every week ... They are looking to minimizing the damage and maximizing the benefit of their actions," Khalaji said. "That's why they don't want to rush." Nima, for his part, started an underground awareness campaign in January through which he distributes homemade DVDs about the Green Movement into smaller cities in rural Iran. The videos include footage of speeches from human rights activists and opposition leaders and news clips. He pays for the project out of his own pocket and with the help of a few friends. "There may not be as many demonstrations, but people know the movement still exists and it's more dangerous because you can't see it," Nima said. "Every movement takes time. We shouldn't expect to see any results after only one year," he continued. "You have to be patient. If you really want to get somewhere you have to continue working and struggling."